With no rule change for the 2016 Formula One season, engineers and designers have already started focussing on 2017, where a major overhaul to the rule book is supposed to make these mean machines both wider and faster. Here’s how. With the help of illustrator Giorgio Piola, formula1.com has listed out some of the key changes that are likely to take place for the 2017 season, Likely, because the rule book for the 2017 season hasn’t been finalised yet. But if the recent proposals are accepted then this what future Formula One cars could look like. 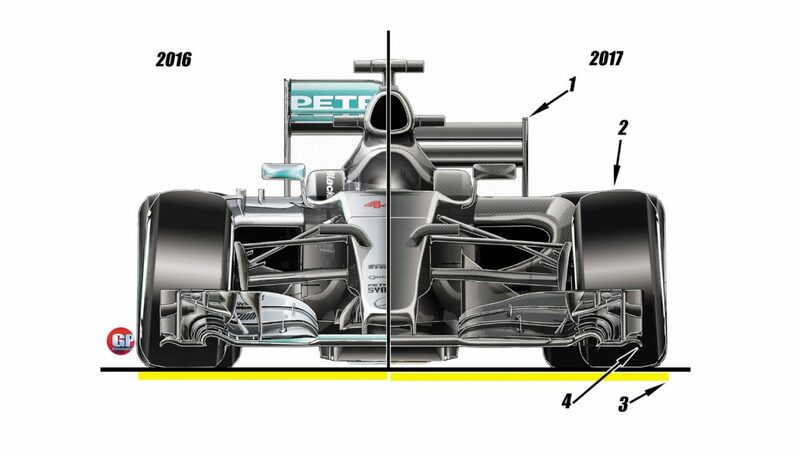 The nose of the 2017 car will be 20cm longer than the 2016 (1). The width of the front wing too increases 165cm to 180cm. The distance from the wheel to wing endplate, however, remains the same thanks to the wings new delta shape (2). The 2017 car will get wider tyres up from 24.5cm at the front to 30cm and rom 32.5 to 40cm at the rear (8). This move alone is expected to make the cars three seconds quicker per lap. The overall width of the car too increases from 140cm to 180cm (4). 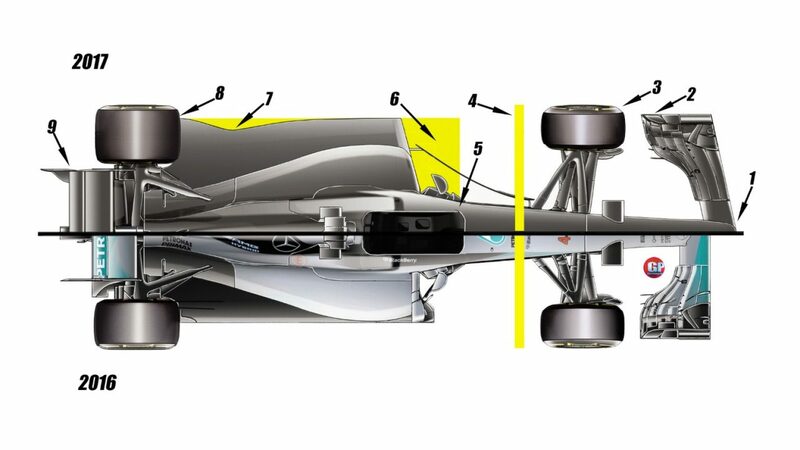 Restrictions on the floor surface area means that the car cannot be 180cm wide (6) for the entire length, thus needing a cutout (7) for the rearward section of the front portion of the cockpit (5). Comparing the 2016 cars with the 2017 ones, it’s quite clear how wide the rear wing (1) is going to be. It also shows that it will be lower than before. It also highlights the change in the width of the tyres (2), the car (3) and the front wing (4). 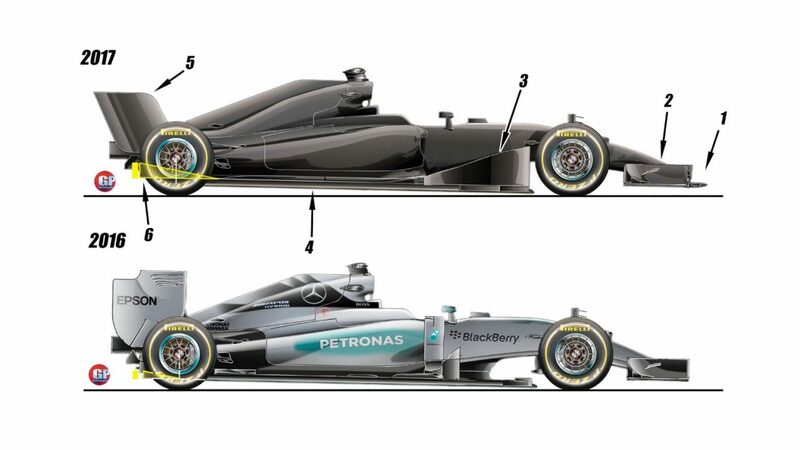 At the rear, the illustration shows how the rear wing (1 and 2) and the rear tyres (3) will look like in future cars. The permitted height of the rear diffuser (4) will be up from the current 12.3cm to 22cm. From the side-on view, it quite visible that in 2017 the diffuser (6) starts 33cm in front of the rear axle rather than starting from behind the axle in current cars. 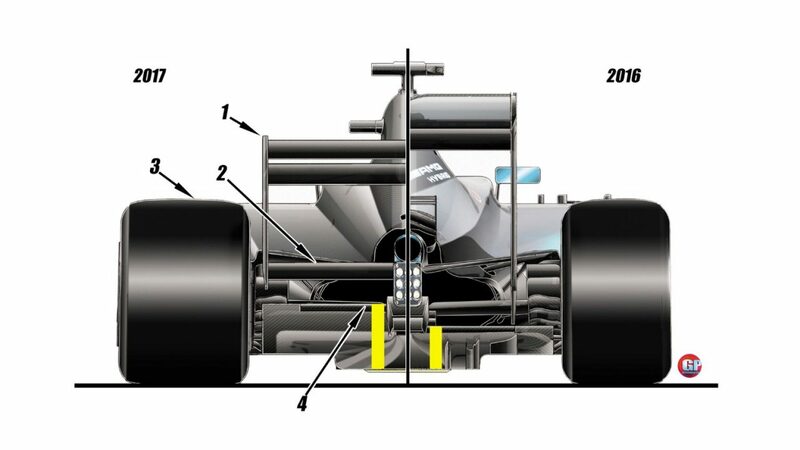 This illustration also shows the return of turning vanes (3) between the front tyres and sidepods and changes to the nose (1) and the front wing (2). The bigger rear wing (5) with the larger overhang to reduce boost ground effect is also shown here. Now with that out of the way, here’s hoping that the 017 Formula One cars sound better than the ones we’ve been used to (a low-pitched drone compared to the ear-splitting wail from Formula One cars that ran on V8s) for the last couple of years. Partially Closed Cockpits in F1 cars from 2017. The FIA has made an official announcement about the new 'Halo' concept in the cars to be introduced in the 2017 season.